A U-boat puts out to sea, festooned with garlands, the tribute of the German people’s faith in its destructive power. Almost all the press and the people believed, like the high command, that unrestricted submarine warfare could bring Britain to her knees. 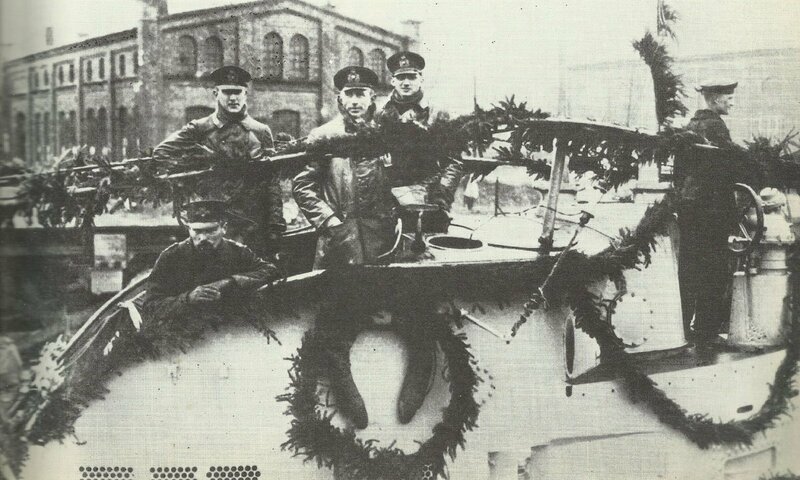 GERMANY BEGINS FINAL UNRESTRICTED SUBMARINE WARFARE CAMPAIGN: 105 U­-boats in service (42 under repair, 51 lost to date – High Seas Fleet 49, Flanders 23, Baltic 2, Adriatic 24 including Austrian, Constantinople 3). 51 more U-boats ordered. Maximum of 44 at sea on anyone day. Royal Navy C-in-C Ireland has 10 Q-ships operational in home waters and Bermuda. Britain: 4 new seaplane stations cover Southwestern Approaches. Over 600 neutral ships refuse to sail. North Sea: HM Special Service Smack I’ll Try (ex- G & E) scores two hits on U-boats. In February Super-Dreadnought Queen Elizabeth becomes Beatty’s Grand Fleet flagship. Aegean: During February Royal Navy Air Service forms seaplane base for 4 planes at Suda Bay, Crete, to patrol against U-boats. Germany: In February German Army now has 15 assault battalions and 2 coys of Stosstruppen (given title of Grenadier, and Guard insignia in March). Each German infantry coy to have 3 Bergmann sub-machine guns. Britain: BEF forms 1st Tank Brigade (2nd on February 15; 3rd on April 24), Central Work­shops and Stores begun on January 7. 57th Division (on February 6) and 59th Division (on February 21) join BEF. Flanders­: German infantry wearing winter white battle dress unsuccess­fully raid British positions near Wytschaete. Severe frost on this and several succeeding nights. This week temperature falls below zero °F. Somme­: Unsuccessful German trench raid near Grandcourt. British trench raiders seize 56 PoWs near Gueudecourt. Occupied France: During February German senior commanders and staffs, attend tactical School at Solesmes to learn new defence methods (school at Sedan opens in March).